Firstly, hi s campaign-army in Eastern Ukraine received recently new military equipment. At the same time, the ambassador of Ukraine in Turkey declared last week that NATO was funding new equipment and training. Yet the operation had seemingly a main strategic aim, an aim of geopolitical value: to serve as pretext for the anti-Russia decisions taken at EU-level, by the same bosses that control the puppet government of Kiev (and finance its economic deficit, and fund its military grown). 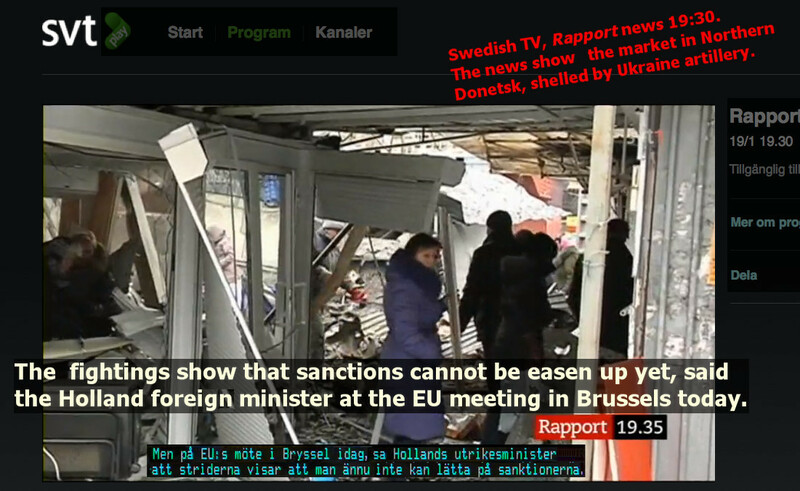 For instance, according to the Swedish TV-news envoy in Brussels, Holland Foreign Minister declared, “the Donetsk incidents show it is too early for a lifting of the sanctions against Russia.” [Swedish-TV “Rapport” 19 Jan. 2015, 19:30 edition]. Likewise, German Foreign Minister Frank-Walter Steinmeier told reporters after the Brussels talks, “In light of the current events in eastern Ukraine, no one had the idea of loosening the sanctions.” [Source here]. And, bizarre as it reads, to exhibit “proof” of these military incidents, Swedish TV shows in the news today the destruction of a market in Northern Donetsk – not mentioning that it was in fact the result of the Ukraine Army shelling. Neither says the media that the prolongation of the sanctions was requested to EU leaders by the US government. 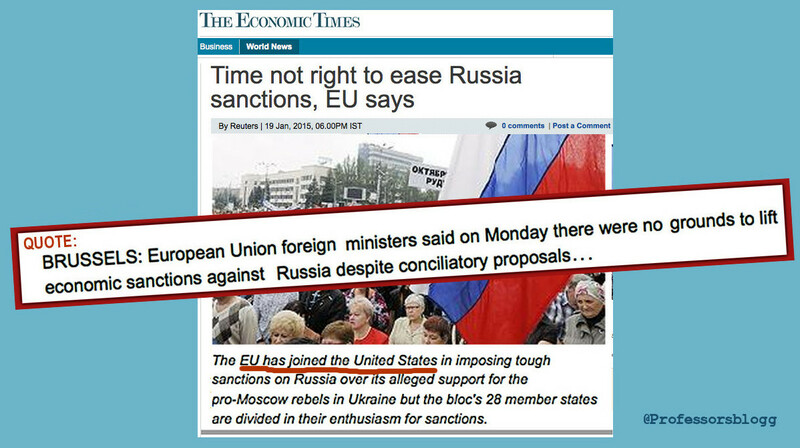 It is EU backing the US-sanctions, not the other way around. 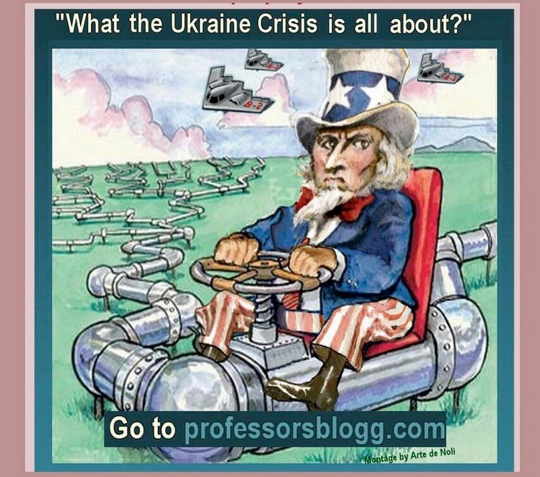 Neither has ever been mentioned that Kiev’s economic survival has entirely become dependent of the EU and US aid. In addition, It was recently made public (by the Ukrainian ambassador to Turkey), that NATO will be funding the ‘progress’ of Poroshenko’s army. The puppet government of Ukraine got the order from their bosses at OTAN / EU to launch the assault on Donetsk 17-18 January. The dramatic events brought about by Poroshenko’s military assault became the “incidents in Donetsk” used by EU to legitimate the continuation of sanctions against Russia. These events were a combination of a) ‘military dramaturgic’ at Donetsk airport magnified by Western media, and b) vast shelling of civil residential areas and other towns in the region. But the sanctions against Russia has NOTHING to do with the “Ukraine crisis”. The truth: US, EU and NATO need the deterioration of the Russian economy for own market gains, and to help future plans of a capitalist war against the never forgotten, neither forgiven “Soviet Union” threat.